An "Evil Weevil" from my float garden. When I cut down my daffodils, I uncovered a cluster of beetles on the ground. The oval shape with a pointed snout made we immediately guess weevil. I did some research and believe they are Black Vine Weevils. I also discovered the small white legless grubs with orangish heads I found in an old dahlia pot are the larval form of these weevils. It's the grubs that cause the greatest harm in the garden by eating roots. Tap cardboard traps on the ground to dislodge hiding weevils. Known as the "Evil Weevil" in the gardening world, now is a good time to eradicate them is before they lay eggs. One adult can lay 500 eggs, and because they are capable of parthenogenesis (eggs don't require fertilization to mature) they are very prolific. I decided to use a manual approach. The beetles are nocturnal eaters, and hide during the day. Look for scalloped edges on leaves to find them. Use a flashlight at night to pick the slow moving beetles off plants and drop them into soapy water. Strip off one side of the cardboard. Or during the day, explore shady spots under plants. Rather than soapy water, I turn the weevils into fish food by flicking them into the lake next to my floating garden. I read about cardboard traps and gave them a try. Tape into a tube, cover if needed. I stripped off one side of cardboard to reveal the corrugated interior. I cut and rolled it into a tube with the rippled side inward. Because we get lots of rain, I covered the outside with duck tape to protect the cardboard. The first night I caught three weevils in my trap. With that success, I'll make some more. Hillside potato patch made from composted soil. Mulching is sort of a kissing cousin to composting. I've been using both gardening practices over the years. According to the Ecological Agriculture Projects website, there are lots of good reasons to mulch. Rain barrels above the garden patch. The last two reasons prompted me to start mulching. This year, I planted my hillside potato patch during a warm spell. After only three days of watering from my 55-gallon rain barrels, it was over half empty. 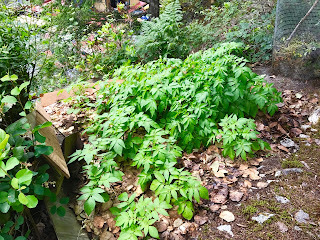 The hillside potato patch covered in leaf mulch. I gathered buckets of salal leaves from the cliff-side path (with the added bonus of a neater trail). After a heavy watering, I spread the natural mulch over the potato patch and watered again. My hope was to keep the sprouting seed potatoes moist enough to get well established. Yukon Gold potato plants with mulch in June. As you can see, mulching with natural products was a huge success. My potato plants haven't been this strong and healthy. I have great hopes for a good crop of spuds come August. My soil depth in the cliff-side patch isn't very deep yet. All of it has come from years of composting. But it's rich in nutrients, and now even richer in moisture. Do you mulch in your garden? What do you use? Has it been successful? You've heard a lot about John. 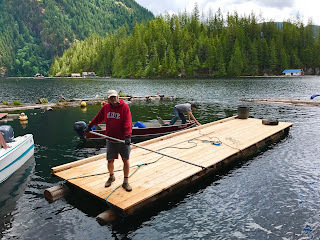 He's our good friend and the man who built our float cabin. He's taught us a lot about living off the grid, and continues to help us with cabin construction projects. Last week he delivered the new floating dock he made to add to and expand our front deck area. We need space for my expanding container gardening projects, and for guests to use to park their boats. With our growing fleet of boats, mooring spots have become quite limited. 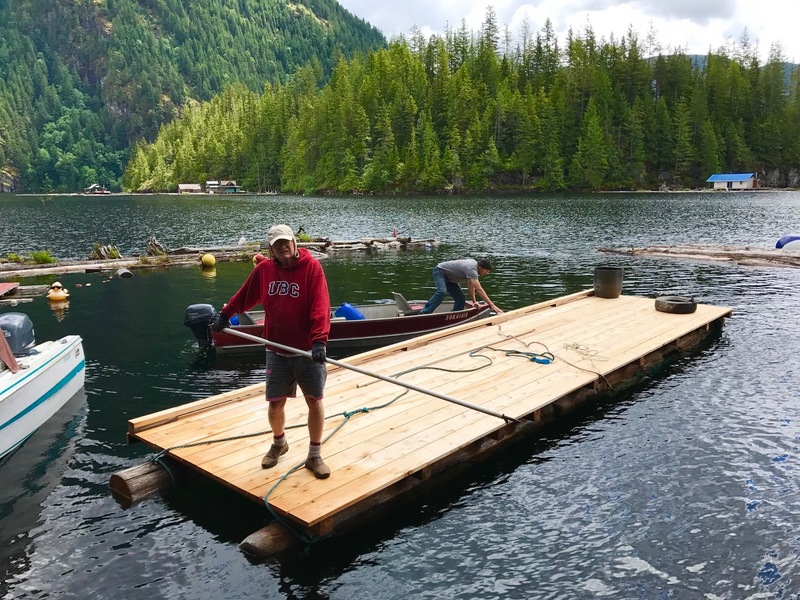 John built the dock on two large logs with extra flotation provided by 55-gallon blue barrels. The top is decked with cedar boards with a raised Bull Rail on one side for boats to tie up. 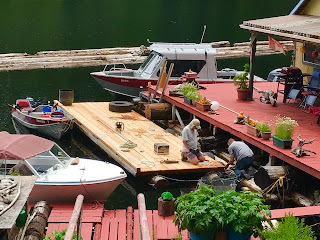 Once the dock was in place, it had to be attached to the front of the cabin. John had to trim one of our float's connecting brow logs. Then tires were attached on the inside as spaces. He cut through the steel belt with a grinder then cut a flap with an xacto knife. That gave an attachment point to nail the tires in place. A turfer (winch) was used to tighten three chain attachments between the dock logs and the cabin's float logs. Now all we need to do is get a stretch of sunny weather to get it painted with stain to match the rest of the deck and to preserve the wood. Spring growth in the float garden. The weather has been mostly cloudy with a few light showers. In between, I've been doing lots of gardening. My float garden is coming along even after a Canada goose got in and nibbled off shoots in the two of the beds on the right. He left the roots in place so most everything survived. I've been thinning my lettuce and kale plants to give the remaining ones more room to grow. I saved the best ones for us to eat in salads. Waste not, want not. 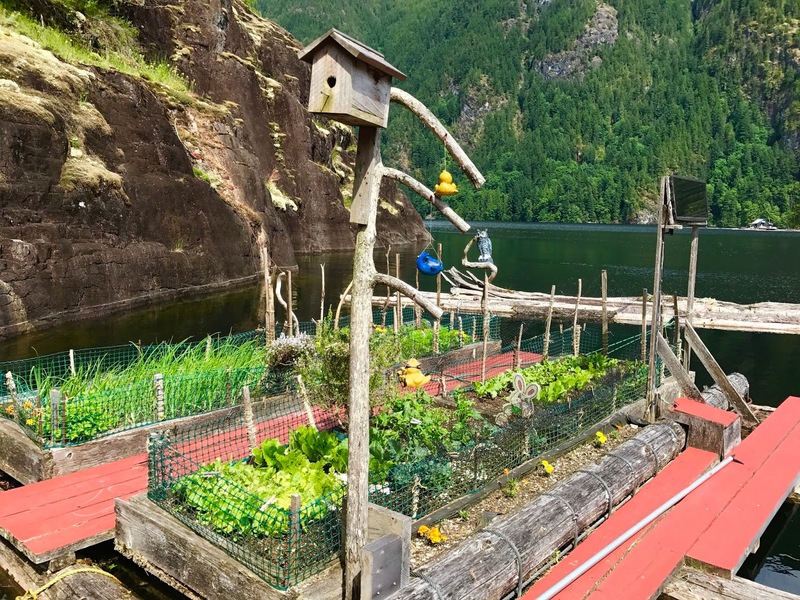 My floating garden with four raised beds and a solar panel watering system. Here's an early spring harvest. My first batch of radishes is finishing up so I planted more. On the left is my first picking of broccoli. It's a new crop for me to try in the garden. An early spring harvest of lettuce, kale, onions, radishes, and broccoli. This year I only have two plastic tubs of potatoes on the deck because I planted more up on the cliff. The plants in containers are really growing, but I won't be able to dig new potatoes until August. Next to the potatoes is zucchini. The plants are growing but no blossoms yet. 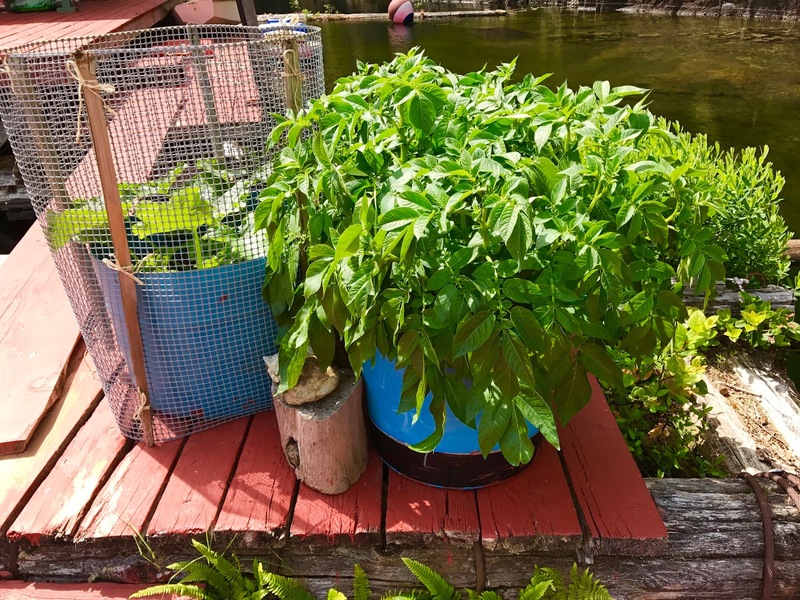 Potatoes growing in plastic tubs and zucchini with a protective cage. Here's a picture of my hillside potato patch when I planted the seed potatoes a month ago. The plants are doing well, but are not as big as the ones in the tubs. There just isn't enough water up on the hill to give them as much as they need. Even so, I'll got a lot of small potatoes when summer ends. My hillside potato patch made from compost over the years. Last fall I divided my rhubarb and put it in a larger pot. It is doing much better and I've picked enough for a rhubarb crisp. Next year I might divide it again and put it in two containers. 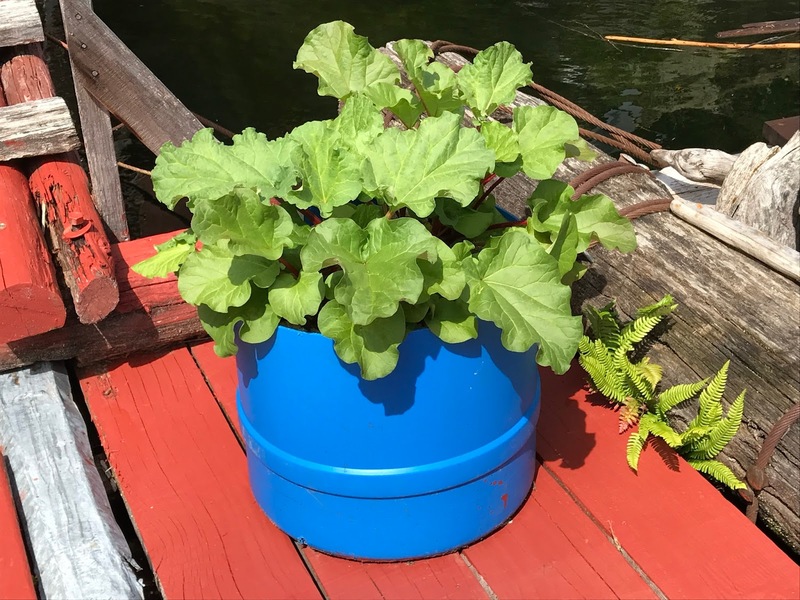 Rhubarb growing in a large pot on the cabin deck. 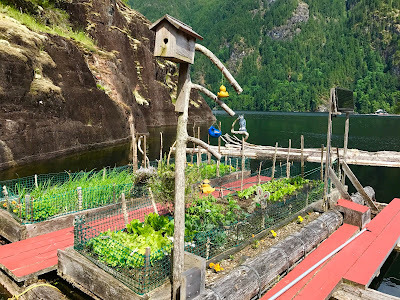 Because I don't have much soil on shore, I grow most of my crops either in the floating garden or in pots. Wayne's ready to ride on his Yamaha Kodiak 450. Last weekend was the annual Powell River ATV Club campout at Nanton Lake followed by a group poker ride on Saturday. When Wayne and I first came to Powell River in 2001, we knew nothing about riding ATVs, or quads as we call them. Our good friend John, who built our float cabin, introduced us to them and taught us about riding in the backcountry. Lining up to draw a card for our poker hand. Soon after, we joined the local quad club. Joining organizations is a good way to get to know people in a new town. And in this case, they could teach us more about the trails and destinations in our local area. Nineteen quads and about thirty people participated. We took our quads off the barge and put them on a trailer to get to Nanton Lake. Each spring we like to do this, one local ride with friends and a quad camping trip. Last year it was to Whistler. This year we will be heading over to Vancouver Island to ride in the backcountry near Campbell River. Cloudy skies and a bit of rain at Little Horseshoe Lake. The poker ride gave us a little bit of everything, sunshine, clouds and even a rain shower at Little Horseshoe Lake. 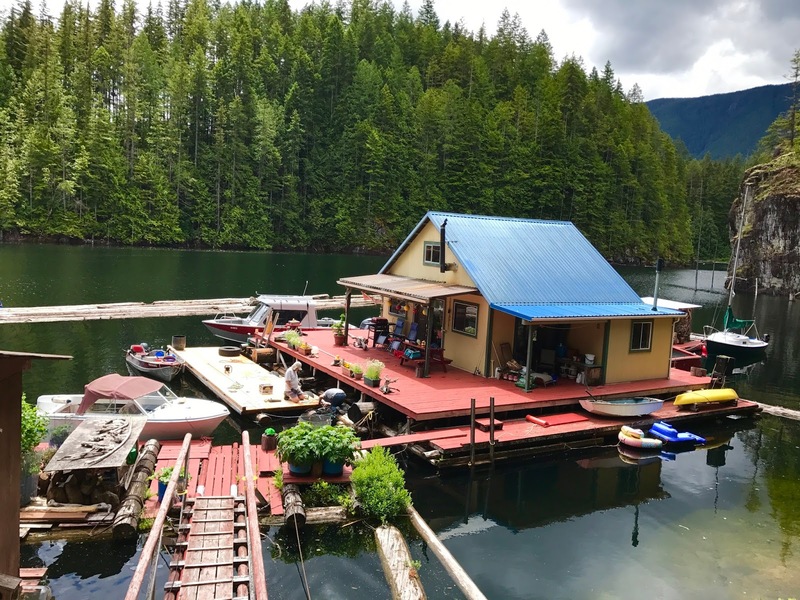 It was a great weekend and we want to thank the Powell River ATV Club organizers for a nice way to enjoy time with friends and the Powell River region. Loading lumber and small items first. Helping a neighbour last week was fun. 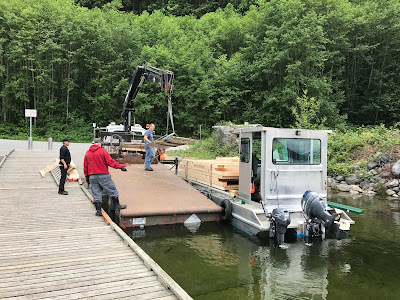 We were already heading down to the lake with our barge to offload the quads at Kinsmen Beach. We put them on our trailer for an upcoming ATV Club quad ride at Nanton Lake and to explore the backcountry near Campbell River on Vancouver Island later this month. That left our barge empty for the return trip so we took a load of building materials back up for one of our neighbours. Next, the delivery truck pulled into position. The materials were to replace a shed flattened during last winter's snow storm. Their contractor constructed the walls in town and had them delivered by a truck with a heavy duty articulating crane. Then we pulled up next to the truck for the large load. We met the delivery truck and contractor at the nearby Mowat Bay boat launch. First, the small items were loaded onto the barge deck by hand. Last the crane positioned the roofing on top of the load. Finally, the large bundle of constructed shed walls was lifted into place on top of the barge's side rails. The "icing on the cake" was a pallet of green metal roofing. Powell River Airport (CYPW) is all decked out for spring arrivals. 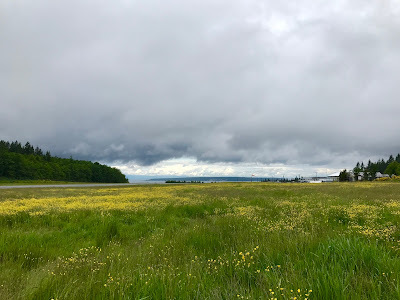 Wildflowers and clearing spring skies at Powell River Airport. Getting to Powell River, British Columbia, is quick and easy by airplane.